Matthew Lott Talks with us about New AZDEN Shotgun Mics! Affordable low price point hight quality mics. Here's another video that I created in less than 30 minutes. Simply copy/pasted the lyrics into the editing program, inserted some stock footage and transitions, exported, and uploaded. I needed to create a quick video in less than 30 minutes: A sing-a-long video, so that kids can learn the lyrics of this song. I used stock footage and a simple video editor. Hi Everyone! I hope you're all having a Happy Monday. Keep us posted on your film, video, and media projects. We're looking for filmmakers and composers to spotlight in the next digital newsletter. Post your production stills, videos, and sound bytes. GoPro 360 Rig - New at The Flug! Canon 5DS DSLR Camera - New at The Flug! (Secaucus, NJ) Panasonic's "Shoot It. Share It" on-line video competition for users of its popular AG-AF100 large image HD cinema camera is open for business! 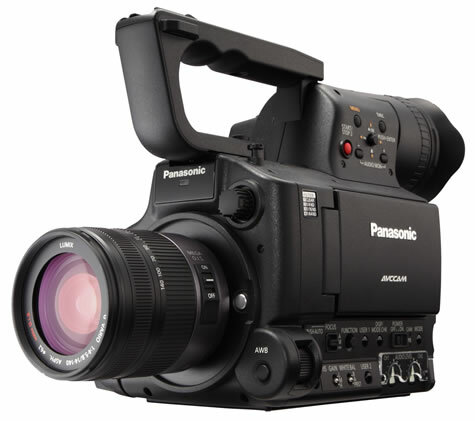 From February 6th, through March 7th, Panasonic is accepting video contest entries from AF100 operators, who can showcase their creative work and win valuable production equipment. At www.ShootItShareIt.com, contestants* can submit up to five videos (each up to five minutes in length) in six categories -- nature, short film, commercial, music video, documentary or student -- demonstrating their creative work with the AF100. A grand prize of a Panasonic 42" TH-42BT300U Pro Plasma Reference Monitor plus a Vocas Micro Four Thirds to Prime Lens Adapter (valued at more than $5,000) will be awarded to the contest winner. A Vocas Matte Box and Rail system will be awarded to each of the category winners. From March 12th through April 4th, the public can choose among 18 semi-finalists (three per category) and vote on-line at www.ShootItShareIt.com for the first-place winner in each category. A panel of judges will select the grand prize winner. The category winners and the grand prize winner will be announced during the NAB 2012 show in Las Vegas, NV (April 16-19), as well as on the contest web site. For complete contest rules and to learn more about the "Shoot It. Share It" video contest, visit www.ShootItShareIt.com. * Eligibility: "Shoot It, Share It" is open only to legal residents of the fifty (50) United States and the District of Columbia who have Internet access and access to a Panasonic AG-AF100. Welcome to the New York Musicians and Composers Group in the Film and Digital Networking Community. Welcome to the New York Film Directors Group in the Film and Digital Networking Community. How Would You Rate James Cameron's 3D Film, Avatar? How Would You Rate the 2009 Sci-Fi Movie, "Moon," Directed by Duncan Jones? maso15 Glory lies in the attempt to reach one's goal and not in reaching it.